Here you can see the butternut squash peeking out of the finished bbq shrimp. BBQ Shrimp with Butternut Squash is a truly delicious fall dish. Because let’s be honest, orange food on your plate somehow just always tastes like fall has arrived. 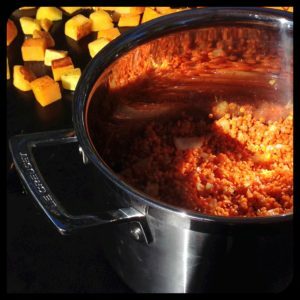 Red Lentils cook in a pot on evo grill while butternut squash sears. Orange food means fall. And by now you’ve probably outgrown your love of candy corn. This dish is a better (and healthier) alternative. Full of great fall flavors and that perfect orange hue. 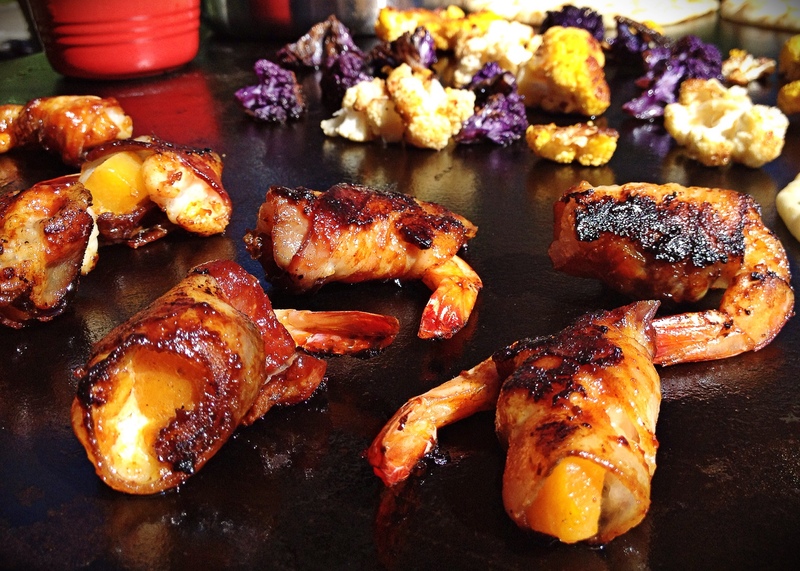 These bacon wrapped shrimp will impressive both on the table and in more importantly in your mouth. But the absolute best part? Only 5 Ingredients! They combine to give maximum flavor and texture way beyond 5 ingredients. Paleo Friendly, Low Carb, Gluten Free and yet totally craveable. That’s a whole lot of “special diet” check marks when entertaining a group! But trust me, no one will think “diet food” when they taste these. I love the arrival of all the varieties of hard squash that signify fall in the produce aisle and farmers markets. I hope that this recipe is a creative new inpiration to use some of it. I like to serve additional simply grilled fall vegetables as a side. These colorful cauliflower make for a dramatic and healthy plate. 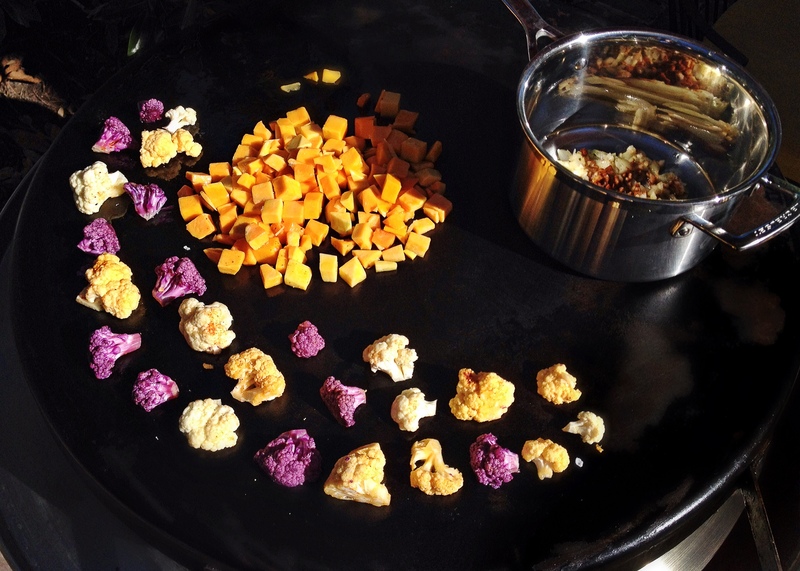 You might even get a kid to love cauliflower if its orange and purple! 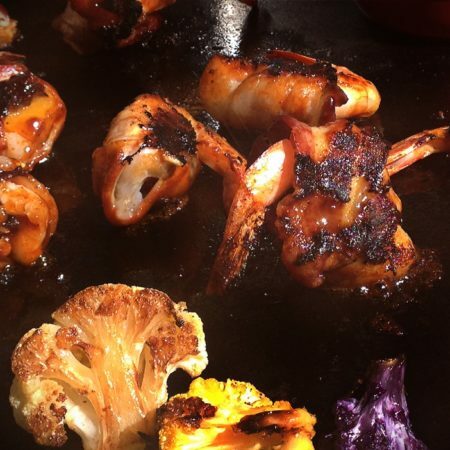 Because when you team up sticky caramelized shrimp with creamy butternut squash and crispy bacon, even vegetable challenged individuals will swoon. I also usually make extra butternut squash cubes and serve them alongside as well. This simple recipe does have two secret ingredients in its humble list of 5. These help elevate it beyond average bacon wrapped shrimp. One of my favorite healthy condiment finds. 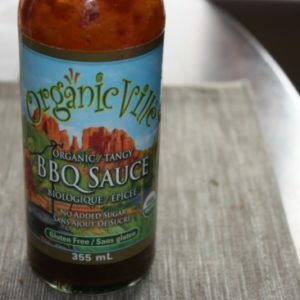 Organicville BBQ Sauce. I get mine at Whole Foods. 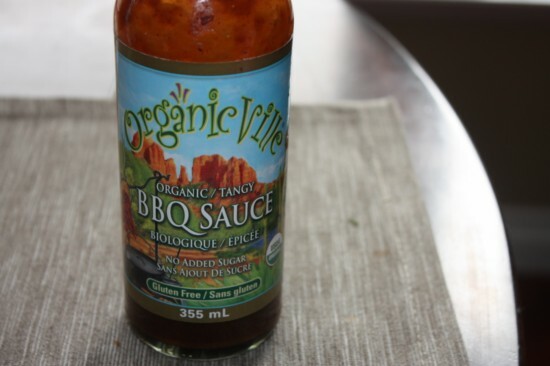 First, I use Organicville Barbecue Sauce. In addition to being a superior organic product, it also contains absolutely no sugar. Agave really gives it a nice balanced sweetness that complements perfectly without overpowering the natural sweetness of the shrimp. Your guests will only notice how delicious it is. The second secret ingredient is dates. 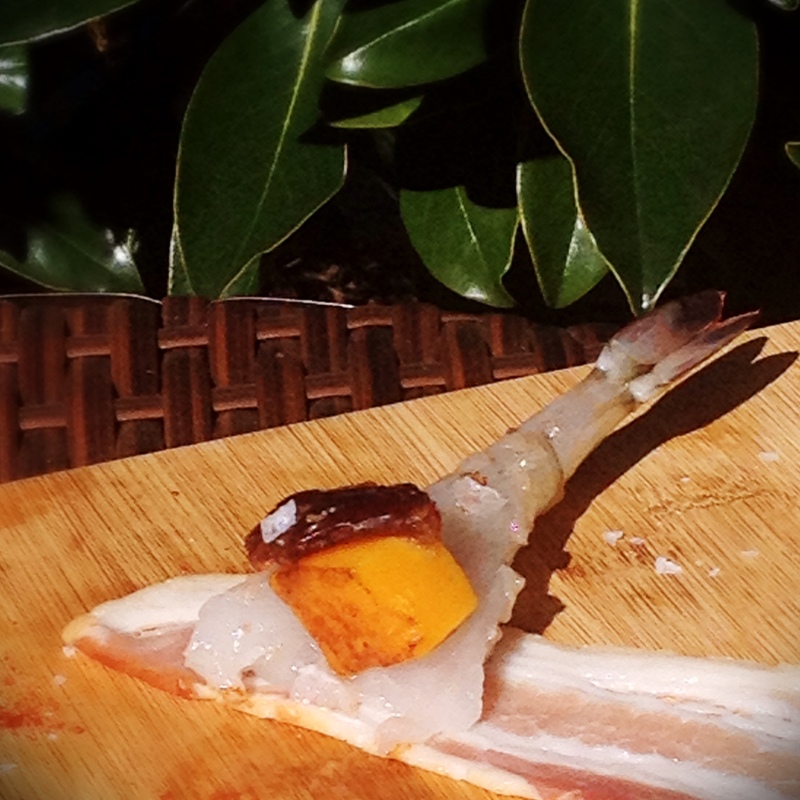 I tuck a quarter of a medjool date inside each shrimp along with the butternut squash. The date gives a nice pop of sweetness and texture to the dish. Here is everything you need to make an impressive fall dinner. 1.Prepare squash. Most stores now sell squash already cut and cubed so feel free to take a short cut to get this vegetable on your table more often. If you bought it whole, peel and cube squash and toss with olive oil, 1 t smoked paprika, and 1 t salt ( I do the same prep for whatever other vegetables I’m grilling). Cook squash for 10 minutes at medium evo grill (or 375 oven) until lightly browned and softened. Set squash aside. I also begin my cauliflower and red lentils at this stage. Sautéing onions, garlic , cumin and red pepper in olive oil while my vegetables grill. Then I simply add 1 cup Lentils to 3 cups salted water, cover, and let the lentils simmer while I grill up the BBQ Shrimp. Don’t you just love the multi colored cauliflower? It adds such color to the plate. 2. Now, take prepared shrimp and place on top of slice of bacon on cutting board. I will usually make 4 at once assembly line style to speed things up. Top with cube of squash, date piece, and sprinkle of smoked paprika and flake salt. I like how the flake salt gives real control of amount of salt and gives a hit of salt instead of overall “saltiness”. 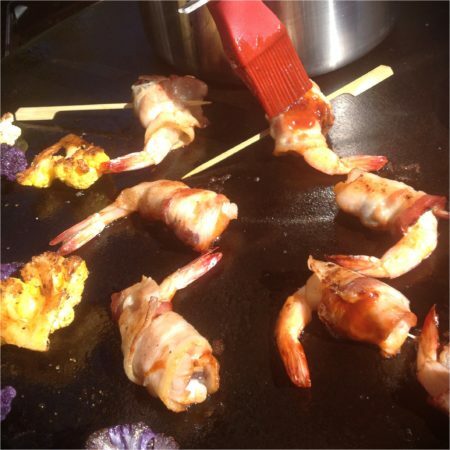 Wrap bacon around shrimp as tightly as possible. Begin at head and move towards tail end. If your bacon seems too long you can to trim the extra. Keep a couple of skewers or toothpicks on hand in case one is difficult to wrap. Lay finished shrimp seam side down and keep cool until finished all shrimp. Shrimp is ready to be wrapped in bacon once topped with dates and squash. 3. Cook wrapped shrimp seam side down at medium on evo grill. After about 3 minutes flip over. You want to achieve maximum browning on all sides without overcooking the shrimp. The bacon really helps keep the shrimp from drying out. Once flipped, baste with the bbq sauce. Baste the shrimp with bbq sauce once you flip them. Here the shrimp have been basted and flipped again. Cook an additional 3 minutes, flip, and baste other side. I give the shrimp a little time on its head to caramelize the top. 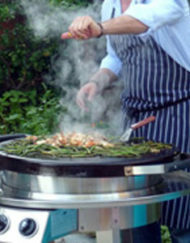 As shrimp are ready remove from grill and keep covered with foil on warm plate until serving. 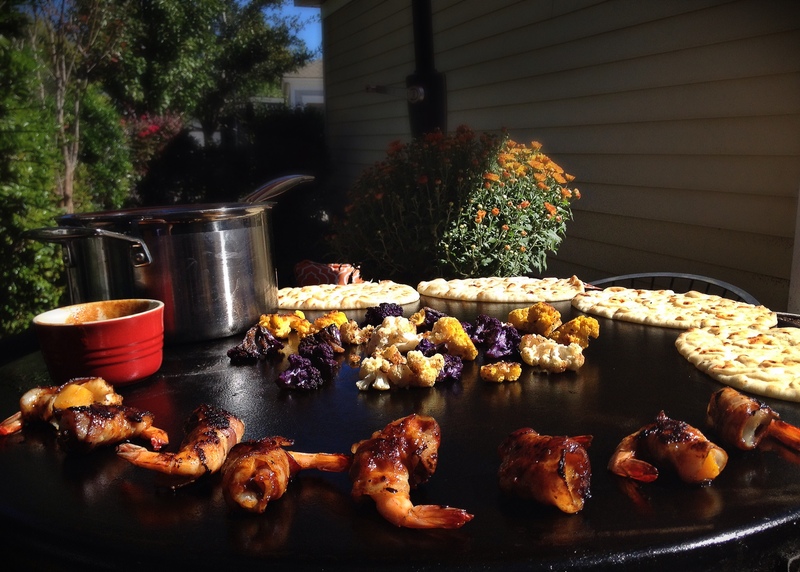 Here I served theBBQ Shrimp with grilled fall vegetables, red lentils, and garlic naan bread warmed on the grill. Red Lentils are inexpensive, full of fiber, protein, iron, and vitamin B. They also look like tiny little pumpkins which makes them an instant hit in my house. When cooked for about 30 minutes, they make a terrific healthy spread for the garlic naan bread. Here’s a simple recipe if you’ve never made lentils. I buy mine in bulk from Whole Foods. And if you happen to have a vegetarian/vegan as a guest, they really make a great vegan dinner option. Just serve the red lentils with the grilled vegetables and naan. No extra work required! A whole dinner cooked at once makes entertaining easier. I grill my vegetables and garlic naan bread right alongside my shrimp. 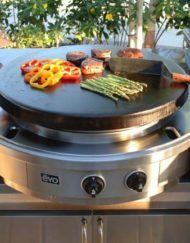 It’s one of the things I love about working on an evo flat top grill. The versatility of both direct and indirect cooking at the same time. 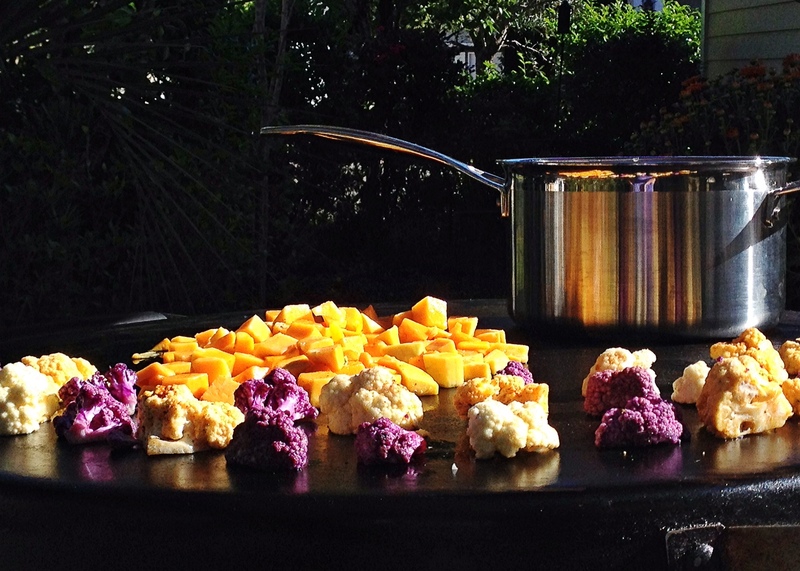 With the zone specific heating, you can sear one thing while keeping another warm. A colorful and healthy plate of food that sings with fall flavors. Enjoy! These BBQ Shrimp are a perfect recipe for Football or Tailgate parties where they can be enjoyed straight out of hand. But they also great for a dinner party when served with Garlic Naan, Fall Vegetables and Red Lentils. Thats the version I’ll feature today. 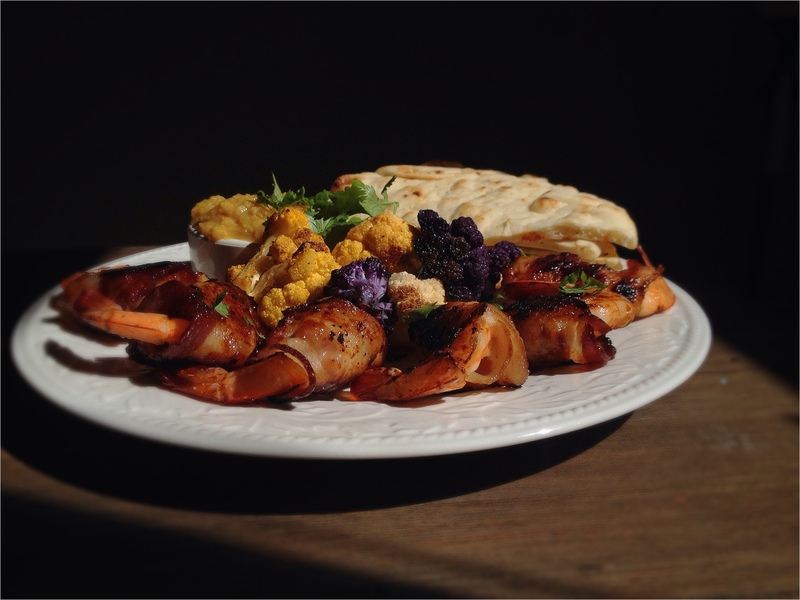 In fact, these bbq shrimp would be a phenomenal starter for your Thanksgiving meal. 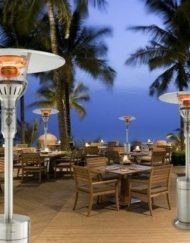 If you do make it an evo grill, it will get everyone outside for awhile (always a plus on Thanksgiving). 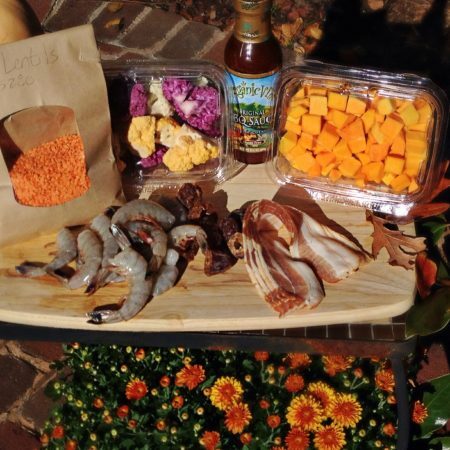 However you decide to serve up these addictive BBQ Shrimp with Butternut Squash and Bacon, I hope you will find them a creative and craveable addition to your fall menus.